AT&T doesn’t enable side-loading apps. They want you to go through their app marketplace. I’m sure it’s a control thing, but I’m a big boy, I can decide what I want to download and what I don’t. Since Amazon launched their Android App Store today, I thought get my phone (Samsung Captivate) enabled to run other apps. Even as one blog points out that it takes 8 steps, I’ll show you here that it’s worse for some! I found instructions here (or here) that were very helpful (follow the link on the 3rd post). In a nutshell, you root the phone, install busybox, copy the settings.db file to the sd card, move it to your computer and use an SQLite plugin to edit it, move it back to the phone and reboot. It was almost that simple. Rooting worked fine for me. I couldn’t get busybox installed. I even tried pulling it from another source and installing it manually. In any case, all you need from it is the “cp” (or copy) utility. I got around that using cat with redirect. I found the SQLite plugin for Firefox easy to use. Once you copy the file back to the sd card, you’ll need to move it back to the system location, so use the same “cat” trick I used above. Once you reboot, you’ll be able to follow the instructions on the Amazon site to download their app store app (and it will work now). 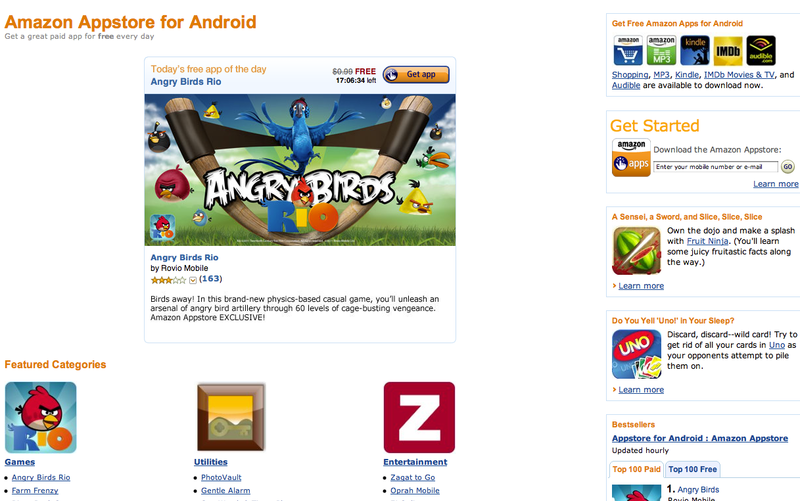 So, enjoy Angry Birds, or whatever other app of the day you grab. Oh, and we (the collective we) should probably buy a few apps to keep new apps coming! This summer, I got a Google Ion, I’ve been mostly happy with it. It sometimes seems a little sluggish, and the camera lag and performance hasn’t been somewhat disappointing. Enter Donut, the latest release of Android. HTC has a special page devoted to support of the Ion, which was handed out at the Google IO conference. It provides details of how to upgrade. This isn’t nearly as easy as iPhone OS updates which are managed pretty much hands-off via iTunes. So, I downloaded the latest Android SDK. I didn’t want to be an early adopter of Donut since there is a certain fear of bricking the phone. (btw, this is the same reason most companies wait till SP1 to install a new Windows OS!) Thankfully, there is a really nice forum for owners of the Ion (aka, the Google IO device). Once I saw that some other people had sorted out the initial wrinkles, I downloaded the image and forged on. I used the “recovery” image and the adb tool from the SDK to copy the image to the phone’s SD card. Then, restarted the phone with “home” held down. then, at the “!” prompt, press “home-end” and select the SD card image to upgrade from. (follow the directions on the HTC page above). I was happy to see the new features that everyone’s been talking about were now available on my phone! The camera interface is nice, and I swear, a little faster. I noticed the universal search, which turns out to be nicer than I initially thought! It not only searches on the phone, but at google as well. Watch the video for examples. I can search for pizza here instead of in maps. I get the option to use maps at that point, but I can call the pizza joint directly, thereby saving time! There is also text-to-speach, which sounds cool, but I just am not sure where I’ll use it. I suppose if I were driving, and it could read new e-mails or tweets, that might be cool (not cool, awesome!). Then, I discovered the voice search. I can say “Call Wendy Mobile” and it will select her number and start dialing! I’m sure there is more this can do, but I need time to play with it. The android marketplace has also been updated. Browsing and finding apps on the device is much nicer. They make it easier to look through top apps and give more information about each app (like screenshots right on the app summary). They’ve also added gesture support. It looks like it will make it easier for app developers to include gesture support in their apps. I played around in the photo gallery and it didn’t seem like swipe or pinch work, so bah! Of course, I’m not sure how much IP Apple has protecting those gestures. Summary: Worthwhile upgrade. Wish it was easier, less angst-filled process. At the 2009 Google IO developer’s conference, all attendees received a special version of the HTC Magic called the “Google Ion”. Quite a nice freebie for those folks. I was lucky enough to buy one from one of those lucky people and have been using it for the last few weeks. I must say, after using the iPhone, there was an adjustment period! Forget about pinch/un-pinch zooming. The UI has more than 1 form of input. This is because the device has a touchscreen, trackball and an array of buttons. So, the Android UI doesn’t have the same uniformity of the iPhone OS. Having used it, that isn’t all bad. While all of the same apps aren’t available on Android, I don’t think we’ll be wanting for long. I’m using twitter/email/web/maps, etc. just fine! The phone integration is great and I found a really cool app “Phonalyzr” which gives me stats on my call log, which is really cool stuff! Android can do multi-tasking whereas the iPhone does not. I can have apps running that get data pushed, or do polling and give me alerts for things like e-mail, tweets, new wifi access points, etc. This alert feature (you slide down the status bar to view them) is really nice, but beware of information overload! On to the hardware. The Ion (Magic) is a little smaller than the iPhone 3Gs. So, you get a smaller screen, but also something that feels less bulky in my hand. The Ion is just a little thicker than the iPhone which give it that sturdy feeling in my hand. It doesn’t feel fragile. I’m sure the screen will get scratched, since it isn’t glass like the iPhone. Of course a screen protector is recommended. I do like the fact that I can slide the back off the Ion and expose the battery, SIM card and MicroSD card. The later can be removed without turning the phone off, which is very cool! The only connection on the phone is the custom port on the bottom. Slightly bigger than a mini-USB, but it isn’t the same. The USB cable is the charger. The phone came with 2 headset options, one with a fully wired set of earbuds with mic and the other has a jack, so you can plugin your own headphones. Oh, the A2DP sweetness should not be overlooked! My ROKR S9-HDs sound great. (As they did with my SE W580i and my iPod Touch) The only real downside to the hardware has been that the phone can be sluggish at times. I think this is because the processor isn’t quite as fast as it needs to be. Maybe I had a few too many apps running, but I haven’t found a great way to determine that either. I can’t finish without mentioning one really cool app. Google SkyMap. It uses your location and orientation (using GPS and magnetometer) to show you the portion of the sky “behind” your phone. Imagine, on a dark, cloudless night, looking up at the stars. Then imagine holding your phone up next to those stars and seeing a sky map for that portion of the sky, with all of the constellations labelled. Now, you turn, while holding the phone out in front of you and the map changes to match what is “up there”. This is just the type of app that makes you go “wow!”.